I did this walk on the 30th December. I had been hoping to walk considerably further than Cheshunt but after a dry start to the day it started raining quite heavily but more importantly the sole of my right foot really started hurting badly. It steadily started hurting more and more and became incredibly painful to walk on and I would had to have stopped anyway regardless of the weather. Anyway enough about foot problems and back to the walk. I took the train from Tottenham Hale to Hertford East. A return ticket cost £7.00 and the journey took 35 minutes. I wasn't sure where I was going to be heading back from when I set out but as the return fare was only 10p more than a single ticket it made sense to get one. From Hertford East station I walked down Mill Road to join the River Lea Navigation and then headed down the towpath for a mile to reach the start of the New River at the New Gauge, Photo 1 was taken looking along the River Lea, photo 2 looking along the New River. The New Gauge building was constructed in 1856 and houses an iron pontoon linked to a weir plate which regulates the daily maximum amount of water that can be taken from the River Lea. From the junction with the River Lea the New River heads across the Meads, photo 3, towards Chadwell Spring. There had been heavy rain overnight and in a number of places the path was quite waterlogged and muddy. The path crosses over a small bridge, photo 4 to the other bank of the river, crossing the railway line to Hertford East, and heads towards Chadwell Spring. Chadwell Spring was the original source of the New River when construction was completed in 1613. The Spring can yield up to 43 megalitres of water daily rising in a 30 metre circular basin which can just about be made out at back right hand side of photo 5. This area is little off the route of the path and required a short diversion and the actual spring itself is fenced off and can't be reached. Close to the spring a small stone monument is inscribed with historic dates and river distances. Heading back to the New River Path itself the route passes the Marble Gauge, photo 7. This was used to regulate the flow of water from the River Lea until it was replaced by the new Gauge. Although the day had started bright and sunny, as I headed down besides the New River towards Ware light clouds started gathering overhead on a strong Westerly wind. Despite the wind it still remained very mild for the time of year, something I have said on just about every walk just recently! Close to Ware the path passes the Boadmead Pumping Station, photo 8, which can pump up to 7 megalitres of water per day into the New River from the chalk aquifer 160 meters underneath. Continuing on to Ware, photo 9, the route joins the London Road for a short distance before rejoining the river just past the junction with Viaduct Road. Part of London Road was quite flooded after the rain and there was a stretch of pavement which needed negotiating with extreme care to ensure I was not splashed by cars as they drove through the water. I've been soaked a couple of times like this, most recently on the Capital Ring near Isleworth, so this time I waited until a bus went slowly by using the centre of the road which meant no cars could speed through throwing up water everywhere. The route then continues alongside the New River, photo 10, down towards Great Amwell, joining up with the route of the Hertfordshire Way for a short distance. 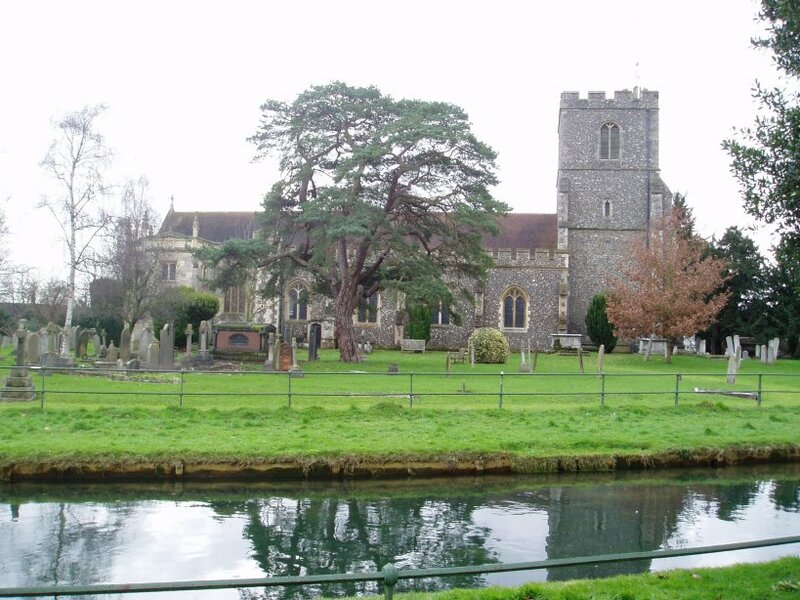 Here the route passes the Amwell Islands which, along with an enormous redwood tree, includes a small monument to Sir Hugh Myddleton who was responsible for creating the New River, photo 11. When it was built the New River followed the 100ft contour of the Lea Valley and the total fall on the original 39 mile route was only 5.8 metres. Leaving Great Amwell the path runs along an embankment some distance above the rest of the Lea Valley off to the left as the river follows the contour line, photo 12. A little further along the path the route passes the Amwell Marsh Pumping Station, photo 13, one of many such pumping stations along the route of the New River. These were built mainly in the mid 1800's to take additional water supply for the New River from deep wells. The pat heads on through St Margarets and down towards the A414. Just past this road the route passes the Rye Common Pumping Station, photo 14. The path then turns left along the Hoddesdon Road for a short distance before turning right on a path between some scrubby trees as the New River Path skirts some building before heading back down to the riverside. Here I stopped at a convenient bench to have my sandwiches. 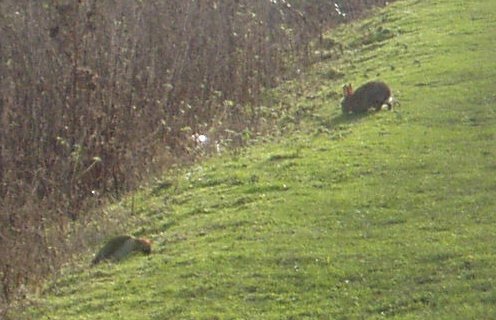 Just down the path a Green Woodpecker was digging away in the grass and a rabbit was hopping around in the sunshine, photo 15. After lunch I continued along down the path towards Rye House, passing the old works in photo 16 on the way, in the distance I could hear the noise from the Kart track at Rye House. For a while the New River Path is running almost alongside the Lea Valley path, the two route being separated only by the railway lines. The route passes besides Rye House Station, where the Hertfordshire way is rejoined once again, and turns to the left to head alongside Hoddesdon. The route crosses Essex Road and heads past the Hoddesdon Pumping Station as it makes its way towards Broxbourne. The path had been passing through a fairly built up area however on the way to Broxbourne there was a brief stretch where there were good views across the Lea Valley, photo 18. Just before Broxbourne is reached the route passes some fine riverside houses, their gardens running down to the waters edge on the opposite bank, photo 19. The path then passes the Broxbourne Pumping Station, photo 20, and a short distance further along Broxbourne Station, photo 21, once again the path running along an embankment overlooking the station. My feet, well particularly my right foot, was starting to hurt quite a lot at this point and I did consider getting the train home from the station but as I had not walked that far I decided to press on. Leaving Broxbourne Station the route heads to the right up Station Road for a short distance before heading across a piece of open ground past Broxbourne Church, photo 22. Up to this point in the walk the New River had never been far from the River Lea but at this point the courses of the two rivers begin to diverge. The route then follows the New River along a tarmac path that leads up to Broxbourne High Road where the path leaves the New River for a short distance. The route turns left onto the High Road and then right down Cozens Lane. The route crosses over the New River but can't access the bank at this point but continues along to a footpath that turns to the left round the side of some playing fields. Passing through a hedge at the end of the fields the route then bears left across some scrubby ground back towards the river. The path then continues on its way South heading past Wormley and under a spur road of the A10 by Turnford where I had a brief stop to rest my aching foot. A lot of new housing had been built by the River near here, photo 23, as in a number of other places I had passed along the walk. Past the new housing the path took a very dingy tunnel under the A10 itself to head on down the New River past the Brookfield Retail Park. The weather had been becoming greyer all day and at this point the rain finally arrived. The route crosses Brookfield Lane and heads down besides what used to be Cheshunt Reservoir South. This was dug in 1836 to supply water for London although it never fulfilled its purpose and was used as a fishing lake. However the reservoir has been sold off by Thames Water for housing and in 2004 it was drained which is how it remains today, photo 24. There are now clear signs of building work on the site being about to commence adding more new housing besides the river. Walking along the remains of the old reservoir the rain became heavier and heavier. Normally I don't mind walking in the rain at all, and over the last year I had, more by luck than judgement, managed to avoid much walking in the rain. (The last really wet day was way back in May when I was walking down besides the Thames after finishing the Darent Valley Path). However the rain really was heavy and that coupled with the pain in my foot, meant I wasn't enjoying the walk that much so I decided to call it a day and head over to Cheshunt station for the train home even though I had not walked as far as I had wanted too. It was a bit of a walk through the damp streets of Cheshunt to reach the station but at least I was able to get a fast train back to the tube at Tottenham Hale. When I reached home I saw a lot of the local non league football matches in the area had been abandoned, as had Watfords game with Wigan in the Premiership which gives some indication of the intensity of the rain. By the time I reached Cheshunt station I had walked 11.7 miles.